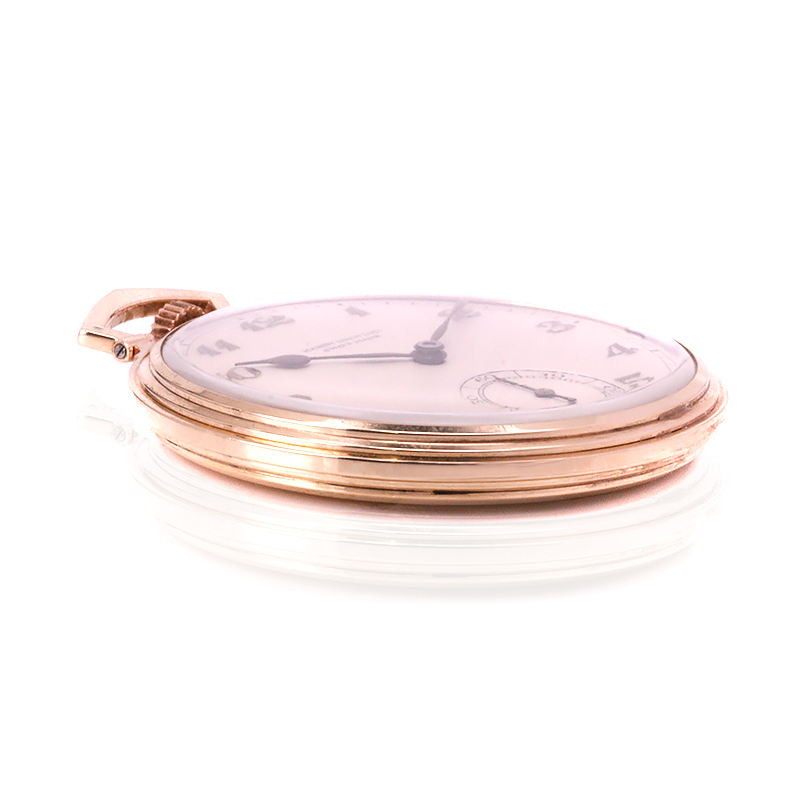 Product code: ES7836 Categories: Sold Items, Sold Pocket watches. The Art Deco period, combined with a gents pocket watch results in this elegant and stylish Art Deco pocket watch retailed by Hardy Brothers in 1934. There is something so nice about the heft and feel of a genuine pocket watch with a mechanical movement inside and this one looks as good today as when it was made all those years ago. Made in a 9ct yellow gold case that measures 45.7mm across by 54.6mm from the bottom to the top of the bow, this is the perfect size to slip into a pocket and then pull out and hold in the palm of your hand. The dial is so clean and easy to read and is signed with the retailer Hardy Bros (Brothers) Ltd who started in Sydney in 1853 and are still trading today. 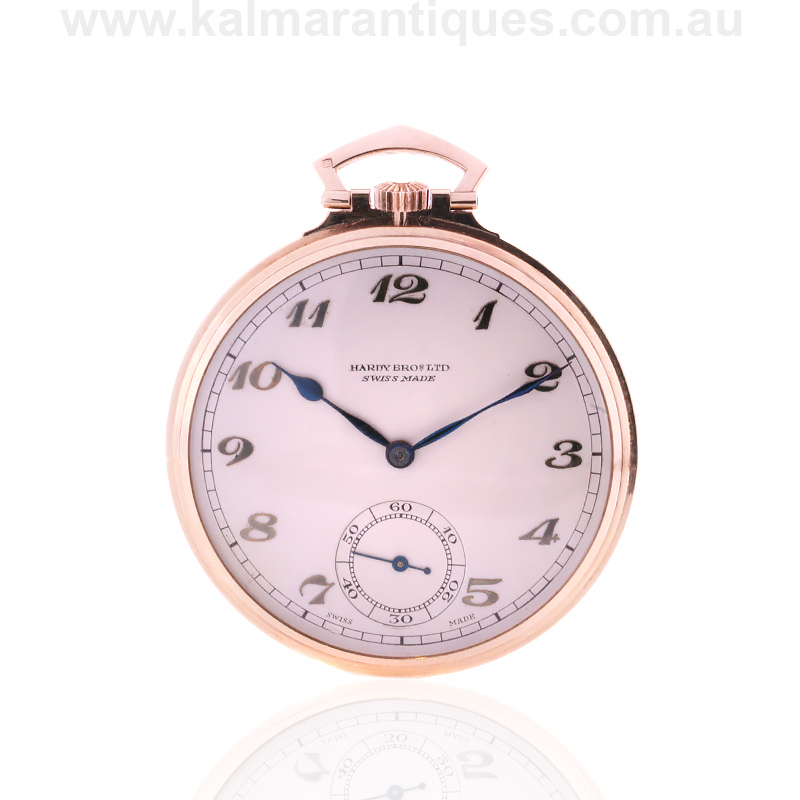 With the sub-seconds at the bottom and beautiful Art Deco font for the numerals, this is a perfect pocket watch to add to a collection or for that special gift for that hard-to-buy for person in your life. Inside is a lovely 15 jewelled manual wind Swiss made movement made by Vertex which has just come back from a full service, runs perfectly and comes with our twelve month warranty. If you have been after an elegant vintage pocket watch that both looks and feels so smart in the palm of your hand, then this might just be the one. Art Deco pocket watch retailed by Hardy Brothers in 1934. Vintage Art Deco pocket watch fitted in a solid gold case. Retailed by the Australian jewellery firm, Hardy Bros Ltd.